Here are some facts about Captain Webb. Captain Matthew Webb was a British professional swimmer. He was the first person to swim across the English Channel, the body of water between England and France. Captain Webb was born in Shropshire in 1848, one of 12 children. He joined the merchant navy when he was 12, and learned to swim in the River Severn near his home. Webb tried to rescue a man overboard by diving into the Atlantic Ocean, while sailing from New York to Liverpool. He was given a medal and £100 although the man was never found. He swam from Dover to Calais in just under 22 hours on the 25th August, 1875. Two weeks earlier, he gave up on his first attempt because of strong winds. Webb covered himself in porpoise fat before entering the water. Because the currents blew him off course, he ended up covering a distance of about 64 km. After his success, Captain Webb made the most of his fame. His name appeared on a brand of matches, and he also endorsed books, pottery and various other products. He gave up his naval career to focus on swimming. 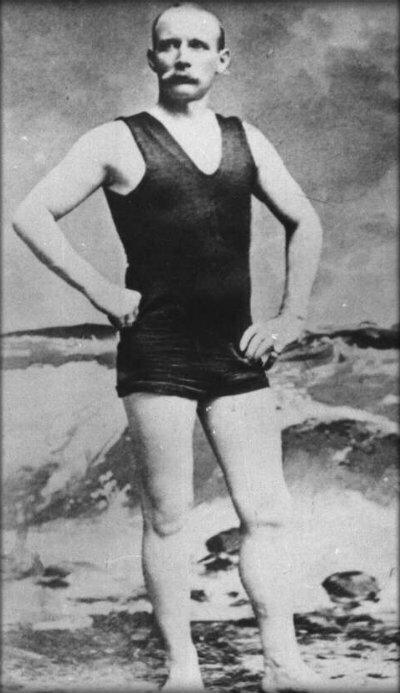 He competed in swimming competitions all over the United States, beating the current champion in a competition at Nantasket Beach, Massachusetts. Webb also took part in several stunts, including floating in a tank of water for 128 hours. He wrote a best-selling book called The Art of Swimming and enjoyed world wide fame. In July, 1883 Captain Webb tried to swim through the Whirlpool Rapids near Niagara Falls. He died while attempting the dangerous swim and was buried in nearby Oakwood Cemetery. A memorial to Webb in his home village of Dawley, Shropshire reads — Nothing great is easy. The Captain Webb pub in Telford is named after the famous swimmer. What next? Discover some facts about other famous Victorians by visiting our Victorians resources page.